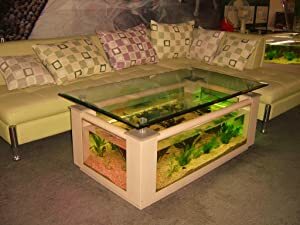 Fish tank coffee tables are great pieces of interior home decor. 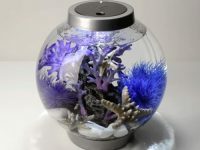 This aquarium type looks stunning to say the least, and wherever you place them, they become the center of attraction since you can’t fail to see and admire it. This article reviews the best aquarium tables with various shapes and sizes for you to choose. Decorations: blue glass gravel, an artificial plant. 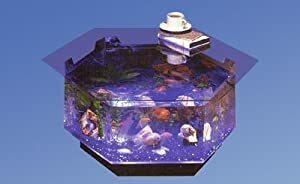 You will be extremely satisfied with this coffee table aquarium and everyone who comes to your home the first time will be constantly praising its beauty. The tank is made of clear acrylic and is specially shaped making it very stylish from view. Its clear top allows you to see your fish from the above when you are sitting and relaxing on the sofa after many hours of hard working. The beneath of the tank is an open space containing and hiding anything needed for operating the tank such as a filtration system, lighting… The unique design allows viewers to enjoy the tank with its attractive aquascape and colorful fish without any obstructive equipment. It is a good idea to put this tank in your living room where it can create a relaxing atmosphere for every family members and guests who visit your home. With this 28 gallon table aquarium, you can stock many types of tropical fish that are recommended for a 20 gallon fish tank such as Tetras, Mollies, Guppies, Platies, shrimps, and snails…. 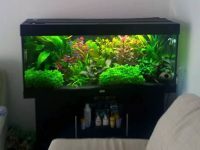 There are open spaces between the tank and the top for you to feed your fish easily. The top isn’t very heavy, so you could remove it to access the internal space of the tank for maintenance and cleaning by yourself without any problems. Filtration: a powerful two-stage submersible filter pump. I personally prefer this aquarium table to the first because of its innovative and octagon shape that is very artistic, luxury but not too expensive. Really that all people are amazed how beautiful it looks. It is surely a great piece of furniture that will get tons of compliments from visitors who come to your home the first time. 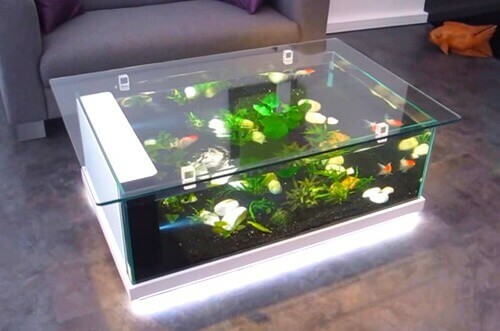 This 40 gallon fish tank coffee table is large enough to keep some large-body fish species such as Goldfish, Cichlids, etc. while smaller tanks can only keep some species of small tropical fish. 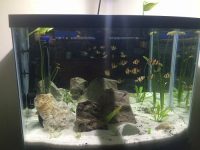 You can also build a great planted aquascape and keep several schools of small tropical fish in this 40 gallon fish tank. By this way, you can see schools of colorful fish swimming around inside the tank while enjoying a delicious coffee cup. The good filtration system of the tank provides its inhabitants an ideal house to live in. The filtration system also keeps the water clean and clear for a long time, so you don’t have to regularly lift the top to clean the tank. The top is not too heavy to lift, making the maintenance and cleaning of the tank a squeeze. Dimensions: 40″ L x 20″ W x 21″ H.
Filter: a built-in ecological filtration system. Lighting: 2 half white half actinic-blue LED lights. Coming from the manufacturer Aqua Vim, this 36-gallon rectangular coffee table aquarium has nothing to complaint. All the great features of this tank make it is a good choice for anyone who wants to be put in a truly sit-back-and-relax mode after a long day of work. It is an all-in-one system for easy setup and best experience. All the equipment of the tank is carefully built and hidden inside it, leaving no ugly things blocking your view and enjoyment. It is equipped with hidden sockets for you to plug in your aquarium heater, air pump, and other equipment that ensures any cords and wires are hidden from view. The built-in ecological filtration system of this aquarium provides your aquatic animals and plants a clean and healthy environment to live for a long lifetime. Besides, its 2 half white half actinic blue LED lights, which are concealed below each side of the tank top, provide not only sufficient lighting for the aquatic inhabitants but also aesthetical enjoyment for the viewers. Additional shorter under-glass-top legs help you lower the gap between the glass top and the tank top edges that other aquarium tables couldn’t. By narrowing this wide gap, you can prevent your fish from jumping out of the tank as well as prevent your cat and children from reaching into the water. The base of this tank table is also equipped with rollers for you to move it around easily. Others: filters, pump, aerator, artificial plants. 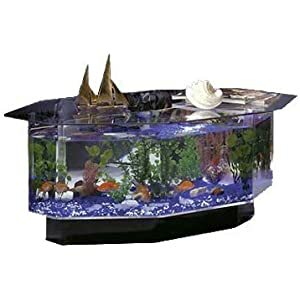 This is also a beautiful fish tank coffee table from the manufacturer Midwest Tropical but it comes with a different shape and brings you different nice experiences. 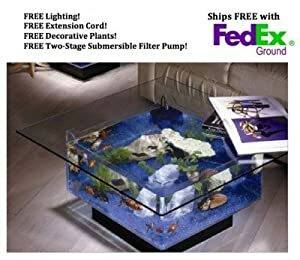 The 25 gallon square coffee table aquarium will be an attractive stunning focal point of your living room that attracts anyone who looks at it the first time. The product includes almost you need to get started such as a filter, light, aerator and some artificial plants. Filter: a filtration system hidden in the pedestal base. This cube 15 gallon fish tank table is small and compact in size making it ideal for a small room or office. 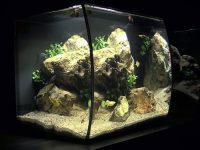 The main tank is made of high-quality glass and acrylic making it very vivid and stylish from view. With the small and compact design, your kids can enjoy and play with their fish easily. It is also very easy for you to clean and move the tank. This product has some disadvantages that need some small modifications to make it better. 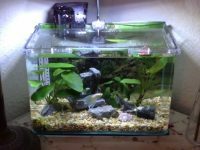 The filter is not strong enough to keep the tank clean and your fish healthy. This problem can be easily solved by using an additional aquarium filter. Besides, the wires are very noticeable and need to be hidden from view. 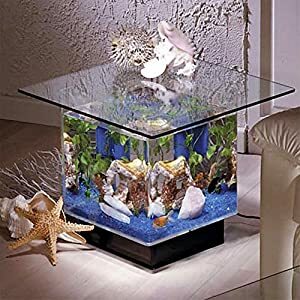 If you love this cube fish tank table, you could make some small modifications to hide its noticeable wires. Goldfish with their larger bodies and beautiful colorations are great to keep in a table aquarium because they provide good viewing from both the side and the above of the tank. Goldfish can be found in a variety of colors from black, yellow, orange, red, etc. that you can choose what you like best. You can also choose small tropical fish for your fish tank coffee table. Small tropical freshwater fish come in every color under the sun for you to choose. Guppies, Mollies, Swordtails and other small popular freshwater fish are outstanding additions to a tranquil freshwater coffee table aquarium. If you are looking for a little bit more of a challenge, you may opt for Rift Valley Cichlids, where you will find some of the most colorful and amazing fish life of all. I would not advise you to keep saltwater fish in a coffee table aquarium unless you have a very good experience with marine systems. Besides, a saltwater reef system needs to install much equipment to work smoothly and you may not want to place any noticeable equipment except your aquarium table in the living room. Is their a place to buy this particular table at? Thanks so much! P.S these are fantastic !